Dublin Cycling Campaign is getting stronger and making a real impact. That was one of the core messages garnered at our action-packed AGM held on Saturday 15th of September in The Tailors’ Hall, Christchurch. The well attended meeting attracted familiar and new faces, all of whom have been energised by the Campaign’s work over the last 12 months. Dr. Paul Corcoran has been elected for a further year at the helm (thanks Paul!) and joining him as now as Vice Chairperson is Dimi Kirova, who has a wealth of experience in the NGO (Non-governmental Organisation) and business sectors. We thanked Muireann O’Dea for her sterling work over the last few years as DCC Vice-Chair as she stepped down. Colm Ryder and Paschal Comerford were re-elected as Secretary and Treasurer respectively. Each of our four ‘Aim Groups’, the working groups focusing on the main planks of our DCC Strategy (see here), had strong and experienced coordinators (re-)elected for 2018-2019. This means that as new volunteers join DCC, they can easily plug into our core campaigning work on infrastructure, policy and traffic law enforcement, perceptions of cycling and other domains. We now also have much more focused groups working on our main current campaigns and plugging into broader advocacy coalitions - e.g. on the Liffey Cycle Route, Love 30, Allocate for Cycling, the 2019 Velo-city International Cycling Conference and Tackling Bike Theft. If you are interested in any of these spheres of work or specific campaigns, do please contact us. We would love to hear from you! Our groups organised geographically to address issues in Dublin City, South Dublin, Dun Laoghaire Rathdown and Fingal also received boosts at the AGM with more people getting involved in each of them. This enables us to shape policy (and even the shapes of proposed cycle facilities!) much more effectively. On the negative side, DCC is still struggling to raise funds. These would enable us to run stronger campaigns and better represent the needs of everyday cyclists, so if you know anyone out there who can help us out in that realm, we would love to hear from you or them. It could be a retired person (from the public, private or NGO sectors) with spare time on their hands, or perhaps someone in the corporate world who can help us tap into CSR (Corporate Social Responsibility) funds or access other funding sources / opportunities. 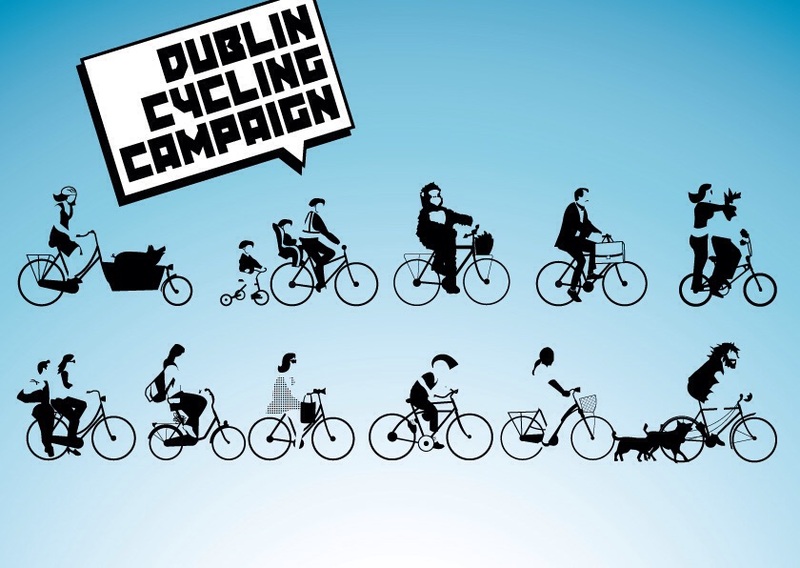 All in all though, Dublin Cycling Campaign can look back over the last year - and indeed the last 25 years of advocacy work - and feel that we have succeeded to some extent in bringing the bicycle in from the margins of transport thinking and policy and closer to the centre. This shift has happened however in a cultural context in which the car is still very much king, in terms of the amount of road space and media / advertising space dedicated to it and in terms of the massive subsidies allocated to the system of motorised automobility in its various forms. We have a long way to go.